Arapahoe Basin Ski Area recently announced it will extend Colorado’s 2013-14 ski and ride season with three bonus weekends in June. The ski area, originally slated to close on June 1, will re-open Fridays through Sundays only for its “summer season” on June 6-8, June 13-15 and June 20-22. And there’s still a chance A-Basin could extend all the way to July 4. A-Basin will be open for snow riding at least through June 22 (A-Basin photo). Arapahoe Basin ushered in the 2013-14 Colorado ski and ride season on October 13. 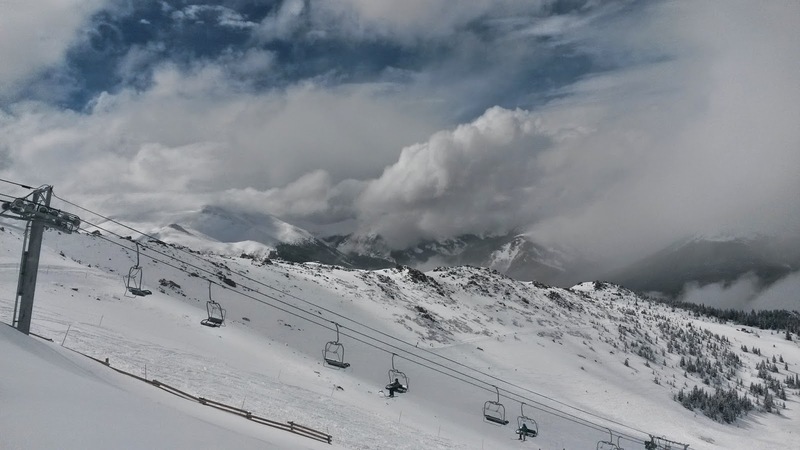 So far this season, A-Basin has received more than 440 inches of snow, with surprise accumulations in late May allowing for the ski area to extend its operations beyond its scheduled closing date. This May, A-Basin had 15 days with measurable snowfall accumulations, totaling 47 inches of snow for the month. During the “summer skiing” season, the Black Mountain Express and Lenawee Mountain lifts will run from 8:30 a.m. to 2:30 p.m. A-Basin will be closed for regular operations Monday through Thursday starting today (Monday, June 2). Lift-served skiing will resume on Friday, June 6, and from then, lift-served skiing will be offered on Fridays, Saturdays and Sundays only through June 22. All 2013-14 A-Basin season passes, the A-Basin Spring ’14 Pass, and all Vail Resorts season passes good at A-Basin will be valid with no additional charge during the bonus weekends. The majority of open terrain will be top-to-bottom intermediate trails, with the possibility of limited beginner skiing from the Black Mountain Express lift. Ski and snowboard rentals will be available for ages 3 and up every day that the lifts are operating. The A-Basin Snowsports School is closed for the season, and will not be offering lessons during the summer season. Special two and three-day tickets are available for use on the bonus weekends only, and can be purchased online or at the mountain. These tickets can be used any day of the bonus weekends. Two-day tickets valid during the summer season are $72 for adults (ages 15+) and $50 for children (ages 6-14). Three-day tickets valid during the summer season are $99 for adults (ages 15+) and $60 for children (ages 6-14). Guests can stay up-to-date on summer season terrain, ticket pricing and skier services at A-Basin’s Summer Ski page (arapahoebasin.com/summerski). It remains to be seen if A-Basin can push the ski season to July 4. Arapahoe Basin has extended its season to the Fourth of July several times over the course of its history: 1993, 1995, 1996, 1997 and 2011.